The RANE Research Group in collaboration with Cape Farewell and the Eden Project, are pleased to announce a call for nominations as part of the launch of ShortCourse/UK. UCF Award Leaders are asked to nominate two of their current students to take part in this exciting initiative which provides the opportunity to learn and work alongside some internationally renowned artists, designers and scientists. 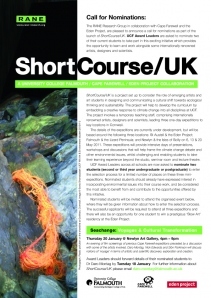 ShortCourse/UK is a project set up to consider the role of emerging artists and art students in designing and communicating a cultural shift towards ecological thinking and sustainability. The project will help to develop the curriculum by embedding a creative response to climate change into all disciplines at UCF. The project involves a temporary teaching staff, comprising internationally renowned artists, designers and scientists, leading three one-day expeditions to key locations in Cornwall. The details of the expeditions are currently under development, but will be based around the following three locations: St Austell & the Eden Project; Falmouth & the Lizard Peninsula; and Newlyn & the Isles of Scilly on 6, 13 & 20 May 2011. These expeditions will provide intensive days of presentations, workshops and discussions that will help frame the climate change debate and other environmental issues, whilst challenging and enabling students to take their learning experience beyond the studio, seminar room and lecture theatre. UCF Award Leaders across all schools are now asked to nominate two students (second or third year undergraduate or postgraduate) to enter the selection process for a limited number of places on these three mini-expeditions. Nominated students should already have expressed interest in incorporating environmental issues into their course work, and be considered the most able to benefit from and contribute to the opportunities offered by this initiative. Nominated students will be invited to attend an organised event on 20 January at Newlyn Art Gallery, where they will be given information about how to enter the selection process. The successful applicants will be required to attend all three expeditions and there will also be an opportunity for one student to win a prestigious ‘Slow Art’ residency at the Eden Project. This entry was posted in Professional Development and tagged Art, Environment, Professional Development, RANE Research Group, UCF Research. Bookmark the permalink.